16 days - incl. forth and back - to Mexico. Not much time, so I had to choose where to go and where not to go. "Lonely Planet" helped me on that matter, so I chose the cities of Mexico City, Oaxaxa and Puebla to visit. On the map you can see where they are. The trip was great beside one thing, that also affects this site. 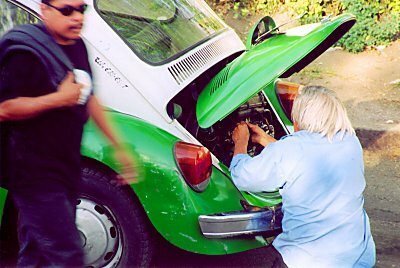 When I got to Oaxaca I chose to put a finger through the more sensitive part of my camera when I was changing film. And then camera was kaput!. So I have got almost no pictures from Oaxaca, and that a bad thing. Just to make this site worth watching, I have "stolen" som pictures from other sites. I bought myself a cheap camera in Puebla. Eventhough it was better than I thought, it's not exactly as good as my good old mate from Nikon - but you have to live with that. It's a 1½ hour flight from Billund to Amsterdam - and then a 10½ from Amsterdam Schiphol to Mexico City's airport Benito Juares. I'm flying KLM and thats pretty good. Good movies and decent food make it a rather nice trip. Arriving at Mexico City is just like I imagined. Absolutely chaos. Huge line to show them your passport, and all light in the customs-area is out, so all there is is a few torches. Well - I finally get through, and finds myself a taxi. An authorised one, because in this town you have to stay away from anything else. Soon I arrive at Hotel Catedral and checks in at room 502. The hotel is booked through the Internet, and is very central in the Centro Historico-area. A single room is 345 Pesos a night, and is a great bargain. Now it's either 8 in the evening - at least thats what the clocks tell me here - or 4 in the morning - that's what it is, if I compare with the time I had when I left. Honestly - I feel most like it's 4 am. A nice little dinner at the hotel-restaurant, and then room 502 and time for bed. Getting up early - 8 am local time - and a great breakfast in the restaurant. Time for looking at this city. It's not really awake yet. Actually my plans was to find a market, but my map is upside down, so I end up at one of Mexico City's huge road - this one called Insurgentes. There I board an old bus, that for almost no money at all takes me to the suburb of San Angel. It's a very nice place. A few parks where people are selling handicrafts of high standards. I walk around out here for 3 hours, before I find myself a lunch at a local restaurant. A 3 course lunch for 34 pesos (3 US-Dollars). Actually I wasn't aware that Mexico was so cheap. And when this is the case, I take a taxi back to the hotel. It's a 9 km ride - takes almost an hour - so the traffic is pretty heavy here. A short nap at the hotel, which has a much higher standard than I'm used to. For instance, it's not normal that maidservice actually has folded together all my dirty travel-clothes that I had left on the bed. At 5 pm I head over to the Zocalo - the main square not far from the hotel. Then I do something that I normalle don't do. I take a city-tour on the Turibus. Mexico City is HUGE, and there is no chance that I will see much in those few days that I'm here. That's the reason for this trip on a double-decker bus. You put in your ear-plugs, and see and hear about the most important parts of town, while awfull music is playing in the background. It's a 3 hour tour, so we are back at the Zocalo at 8. Then dinner - and a little relaxation in room 502 before going to bed. Head for the Zocalo from the morning and a view of Templo Mayor, to see the remains of som old pyramids. The spaniards destoyed them and used the stones for churches back in 1520. Shame on them! Time for another long walk. Down Avenida Modero and the sinking church of San Francisco. Passing Palacio des Belles Artes and the city-park Alameda Central. Then on through the not very interesting Paseo de la Reforma before I end up in Zona Rosa. Zona Rosa is - in my view - a total tourist-trap. Plenty of bars, restaurants, hotels and shops all made for tourists. Not my kind of place. I find a decent lunch before going to Grey Line and their tourbus to the bullfights. We are 10 people in the bus and we are at the bullfight-arena at 4. First toreador is a clumsy guy. 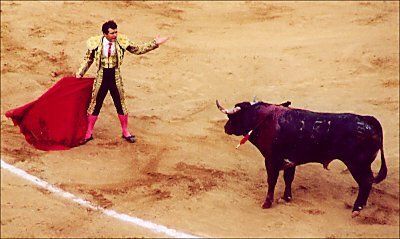 He needs 4 attempts to kill the bull. Huge "buh's" as he leaves the ring. Humberto Flores is better. He kills the bull while the crowd roars for him. As an apreciation for his brawery he gets one of the bulls ears. Then he walks around the stage with the ear in his hand looking very proud. One of the girls on the bus can't see what it was he got. When told, she just says "oh - I thought it was something else". Third fighter is Marcal Herge. 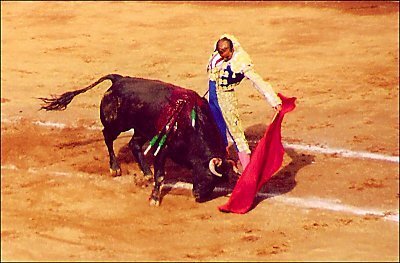 Not as spectacular as Humberto - but he does get the job done - but also have to take some beating from the bull. It's way to rare in this sport that the bull actually wins. Then it's the clumsy guy Alfredo Lomeli again. This time with a bit more of a succes. And then the tourists leave the arean. The bus take me all the way back to the city-center, not far from the hotel. Then it's dinne and back to bed. 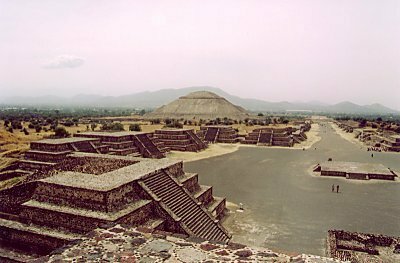 Here you find one of the major tourist-attractions in Mexico, the pyramids "Piramides del sol y de la luna" - the Pyramids of the sun and the moon. Mexico's "heart" was here at about 150 b.c. The pyramides was built 300 years later. A huge job it must have been. You first really notice that when you stand right beside these strange stone-structures. A take a walk around the area for several hours, and also reach the top of the moon-pyramide. At the end you are quite "done" because it's very hot out here. A hat would have been nice - but for some reason thats the only thing that is not for sale among the hundreds of vendors hanging around. Museum-day today. Metro from Zocalo to Chapultepec-park. From here it's a short walk to the huge antropological museum. 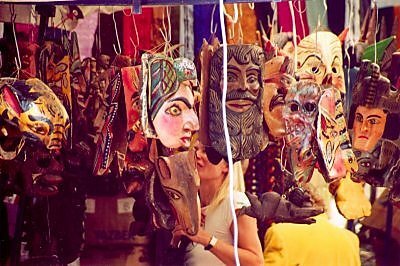 Here you will find everthing from Mexicos past. The museum is split into geographical zones. There are pots, stones and figures from all over Mexico. Very impressive. Outside 4 voladores is making a show. 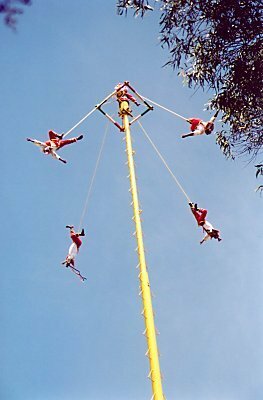 They climb up som large poles, ties a rope around their ankles and then falls down head first, while turning around the pole. Pretty wild to say so. Finally it's a little relaxation in Chapultepec, before I take the Metro back to the Zocalo. Later another walk around the hotel. It's pretty hectic around here. Hundreds of street-shops, where everything is for sale. Dinner at the hotel again. I should have guessed tha Enchilladas Mexicana was hot. It's like your eyes is jumping out of you face. They are - as always - served with frijoles - some kind of mashed beans - and a cool Corona.